If you are one to follow the ever-changing news of diet and nutrition, you’ve probably noticed that lowly, humble fiber has been making headlines, lately. Not only is it making headlines, but it seems to be showing up in the strangest of places: in yogurt, in junk food, in WATER?! The jury is still out on whether or not all of this “added” fiber really has any health benefits. While the jury is off deliberating about whether or not adding fiber to sugar-packed doughnut holes will solve health problems, it’s always been true that fiber from whole, natural sources is not only beneficial to your health but — since it’s from a whole source — it comes equipped with all the necessary nutrients to help your body reap those benefits. Fiber has an undeserved bad reputation — believed not only to be hard to find; but also chalky, grimy, rough, etc. unless it’s somehow dressed up. Believe me, nothing could be further from the truth. Fiber is as close as the tiniest dried lentil. Lentils are like magic beans, in my opinion. If beans are the musical fruit, lentils are surely the loudest members of the wind family. .
Today’s recipe highlights these pint-sized heroes by tag-teaming them with another unsung fiber celebrity: wheat berries. Their exotic name is a little deceptive as wheat berries are not actually berries but rather a completely whole grain of wheat (that right folks… the bran, the germ, and the grain all right there in a tight package, no additives necessary). You can find wheat berries in most grocery stores down the dried bean aisle or in the bulk grains section. They’re a great bargain, too, considering how nutrition-packed whole grains are. 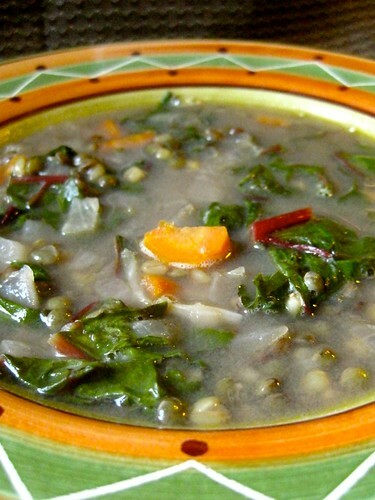 The tag-team of lentils and wheat berries plus the added support of greens and veggies all come together in a potent fiber punch of a little more than 9 grams of real fiber per serving (24g per day is recommended). That’s enough fiber to make a sweater! And it does NOT taste like health food, I promise! 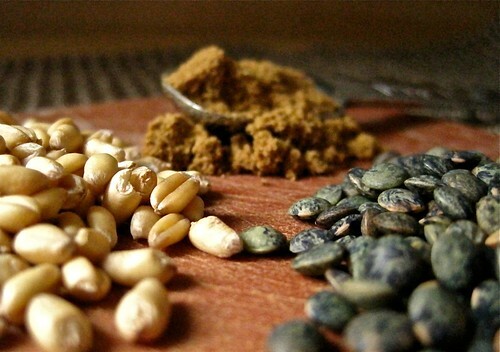 In order to make the soup, you’ll first need to cook the wheat berries, separately. It’s very easy but it takes a chunk of time. It’s best to make this large batch and then freeze what you don’t need for the recipe in little baggies in the freezer. I usually freeze them in small, one-cup bags. I’ve kept them in the freezer for about 6 months without any taste or texture issues. Combine the wheat berries, water, and salt in a large pot. 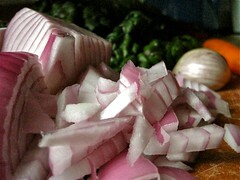 Bring to a full boil, cover, reduce the heat to a low boil, and allow to cook for an hour or an hour and a half. You’ll know the wheatberries are done when their texture is tender (very similar to brown rice, actually). Drain them well. You can pack them into small bags for the freezer once they’ve cooled. Combine lentils, broth and water in a Dutch oven; bring to a boil over high heat. 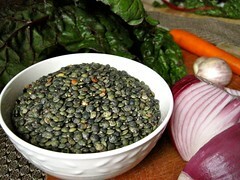 Cover, reduce heat, and simmer gently until the lentils are tender but not mushy, 25 to 30 minutes. Be careful to simmer them gently, otherwise they tend to fall apart. Brown lentils tend to take a little longer than green, by the way. While the lentils are simmering, heat the oil in a large skillet over medium heat. Add the carrots, onion, salt, pepper, savory, and thyme. Saute, stirring occasionally, until the vegetables begin to brown; about 15 minutes. Add the garlic and cumin and; stirring constantly, for 30 seconds (don’t go much longer, garlic burns easily and loses its zest). Remove from the heat. 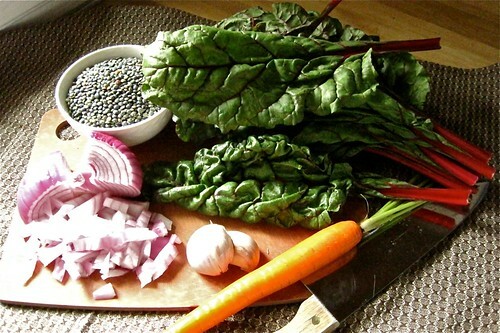 Once the lentils are ready, stir the cooked wheat berries, chard, and carrot mixture into the pot. Cover and simmer until the chard has wilted; about 5-10 minutes. Stir in the lemon juice just prior to serving. Ironically, though everything that goes into this soup is beautiful and colorful, the end product somehow comes up short in the looks department — kinda like the unfortunate-looking love child of two very attractive celebrities. Nevertheless, it’s a very tasty soup and very filling. You’ll find it freezes extremely well, making for a quick, filling lunch option or emergency dinner. Just zap it in the microwave for a few minutes and it’ll taste like someone made you some fresh soup. ~ by Jason on June 10, 2010.
love it! one of the best websites I’ve ever seen!!!! Thanks so much, Skylar! Your gramma just gave me your e-mail address, this weekend. I’m looking forward to writing you!